Steve Lehman 6 Gold Star Award™ ******: Tadasky Wins SL6 Great Artist Award!!! Tadasky Wins SL6 Great Artist Award!!! 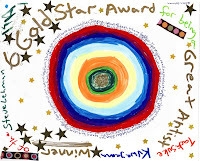 Tadasuke Kuwayama aka Tadasky aka Teru's dad wins the Steve Lehman 6 Gold Star Award™ for being a great artist. I was walking around Williamsburg, NY passing out s.2913/hr.5889 (o works) fliers and I came across the wonderful paintings of Tadasky. I love the these paintings because of the opitcal illusions they create and their technical brilliance. They are like modern mandalas. Luckily, I made it in the door of the gallery, Sideshow, just as his show was to close. Coincidently, Tadasky is the father of the great photographer Teru, of lightstalkers fame.....www.lightstalkers.com. His cute mom brough this to my attention as she gracefully promoted both her husband and son's achievements. The current show at Sideshow Gallery, Battlespace: Unrealities of War, is curated by Teru.